It's Saturday Night, time for some Genealogy Fun after your frustrating week of finding phantom ancestors in online family trees and trying to keep up with everybody on Twitter, Facebook and Genealogy Wise. 1) Let's go time travelling: Decide what year and what place you would love to visit as a time traveller. Who would you like to see in their environment? If you could ask them one question, what would it be? It is the Twentith day of July in the Year of Our Lord One Thousand Eight Hundred and Forty Six in Argenteuil County, Quebec. I see my 2nd great grandparents, William Raeburn and Margaret McCormick standing in St. Mungo’s Presbyterian Church with their daughter Margaret Ann in hand to be baptized. Their witnesses today are William and Sarah Wilson, and their minister William Mair will baptize little Margaret. 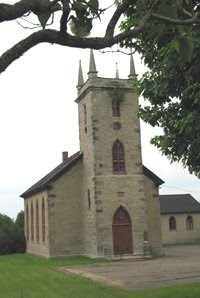 The Raeburn’s have been in Quebec approximetly five years and another daughter was already baptized somewhere in Quebec in 1844. Three children left Ireland with them, and they now have five. But what I long to know is, who are yours parents? Who are your siblings? What was your life like in Ireland? Did you mean to leave it all behind, to never speak of it again and of the family you had in Ireland? Tell me dear grandparents is there a written word of all that you knew, of your ancestry somewhere yet for me to find? Please...guide me to it!! Oops..I exceeded one question and I have so many more! I am sorry I have been away from the blog but it is summer and it has drawn me away to places other than the computer! !